Thanks to the Seahawk-1 CubeSat, a researcher at the University of North Carolina Wilmington has a better-than-bird’s-eye view of the world’s oceans. UNCW, NASA, ACC Clyde Space, Cloudland Instruments and the Gordon and Betty Moore Foundation announced the successful acquisition and retrieval of nanosatellite’s first ocean color image from space. The SeaHawk-1 engineering test image was captured on March 21 by the HawkEye Ocean Color Imager from an altitude of 588 km. The image was downlinked from SeaHawk-1 CubeSat to the ground station at NASA Wallops on March 22 and immediately transferred to NASA Goddard, where it was processed. 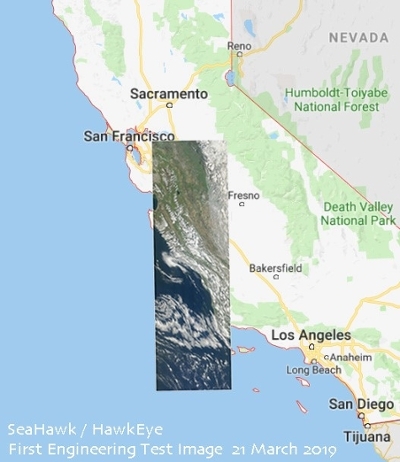 The image is a true color full resolution image taken by HawkEye (image overlay) as it flew southward over the coast of California from San Francisco to south of Santa Barbara. “In many ways, it was only fitting that this should have been its first image since three key locations in the life of our mission are located in California – San Francisco, where the Moore Foundation is located; Vandenberg Air Force Base, from where SeaHawk-1 was launched; and Santa Barbara, home of Alan Holmes and Cloudland Instruments, the team responsible for the design and construction of the HawkEye instrument,” said UNCW Professor John Morrison. UNCW’s SeaHawk-1, launched in December 2018 aboard SpaceX Falcon 9, was one of the 64 satellites included in the Spaceflight SSO-A Small Sat Express, the company’s first dedicated ride-share mission for small satellites. The goal for SeaHawk-1 is to provide free high-spatial resolution images of Earth’s coastal regions. The small but powerful device will expand UNCW’s marine research capabilities, providing a unique vantage point for observing the changing biology on the ocean’s surface and understanding key coastal processes and ecosystems (for example early detection and expansion of harmful algal blooms), according to Morrison. Once SeaHawk-1 is fully commissioned and begins operations, data will be available at no cost through NASA’s Ocean Biology Processing Group and UNCW, added Morrison, co-project manager and lead principal investigator. In the near future, the scientific community will also be able to submit requests for image acquisition through UNCW. UNCW's Strategic Plan emphasizes advance research and scholarly activities. This project is funded by the Gordon and Betty Moore Foundation through Grant GBMF4526 to UNCW at Wilmington, Department of Physics and Physical Oceanography, and Space Act Agreement 450-AGMT-0149 between NASA and UNCW. by the HawkEye Ocean Color Imager on March 21, 2019 from an altitude of 588 km.